it's all the "b's" that get me excited and collections i look forward to during fashion week: burberry prorsum, balenciaga, balmain. the above look from balmain fall winter 2011 is my favourite look, love the dramatic shearling coat. as balmain menswear progresses, there are more looks introduced for fall 2011. some of the balmain classics remain, like the shearling coats, crested button peacoats and leather bomber jackets. these were all reworked and tweaked. however, i'm not really warming to the styling of most of the looks. despite using what appeared to be luxurious materials, the overall styling is very high street, and it's really disturbing. is this balmain's revenge on zara? 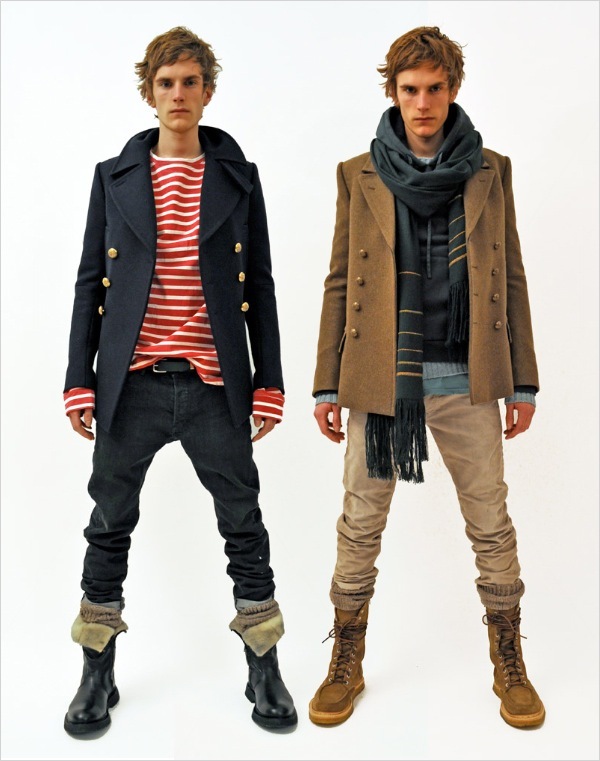 i hope balmain will rope in karim sadli to photograph them again for their lookbook as with previous seasons. i am a little disappointed. but i am convinced it's the styling that i don't agree with. that aside, there are a few pieces which i love: the shearling jackets and the black leather bomber. I feel Balmain menswear has always been a bit high street, it never is going to compete with other more established and up in coming progressive designers/design houses. The hoodie in the ghastly neon peach is just one of the many things that don't sit well with me. Couldn't agree more Michael. But the look book usually turn things around dramatically. Looking forward to that already. i just feel like there's too many clothes, too many layers, too many creases in these looks. there too much going on that does not actually make sense anymore. like the hoodie as mentioned by michael. i guess we'll be appreciating balmain more in the lookbook. Putting aside the fact that Balmain charges incredible prices for high-street styling (quality materials are fine but the clothes still have to be interesting), I'm struck by just how much this collection seems to be about three seasons stale. More than that, it seems calculated to his just about every major trend over the last three years. Denim shirt? Check (wish that trend would die). Collegiate/plaid scarves/shirt? Check (also wish that trend would die). 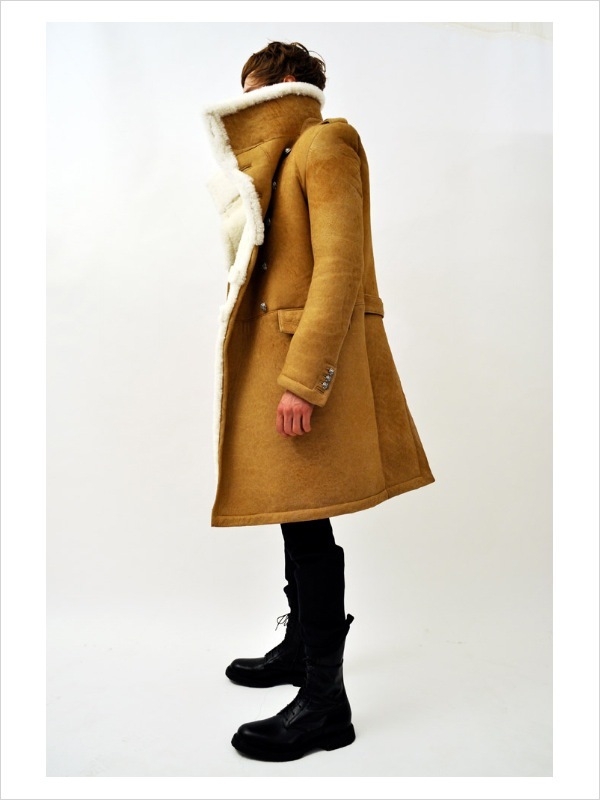 Shearling? Check (that trend should have never really started). Lace-up combat boots? Check (I have no problem with them but they've been done to death). Skinny jeans? Check (now there's a stale trend). There's not a forward looking or really interesting piece in the collection (oversized shearling coat maybe, but it was done two seasons ago by Prorsum, or in black by Rick Owens for several seasons now). At the end of the day I will stick to my general outlook on Balmain: it's made mostly for people who don't have much personal style but are convinced that spending painful amounts of money on trendy clothes will make up the difference. Psychologically it has to be that way - the guilt of paying that much virtually forces you to think, "No this must be good stuff. No I'm sure." This of course, excludes you, sir, who are, in all seriousness, stylish despite the occasional temptation toward the uber-expensive Balmain world. I think I already accept the fact that, for Balmain Homme, it's more of a wardrobe than groundbreaking conceptual ideas, and that explains why there're pieces that appears more than once. 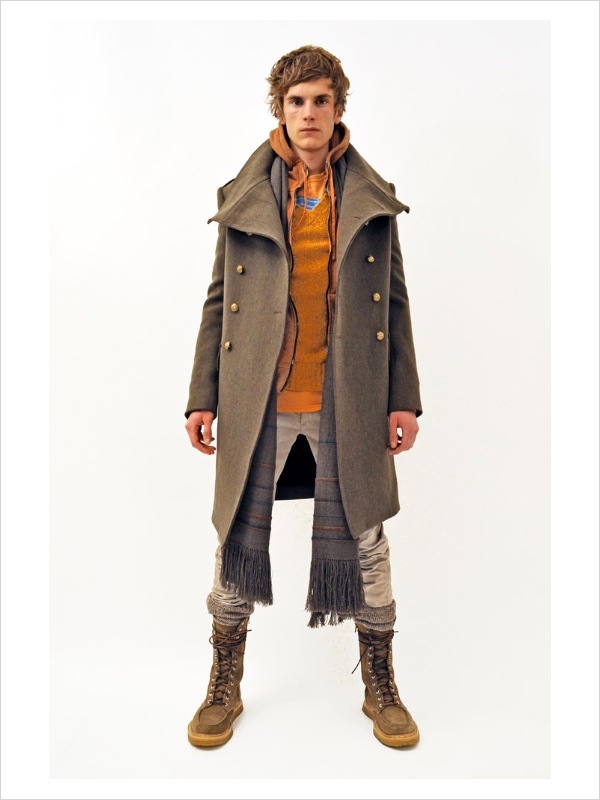 I don't like the aqua turquoise and the mustard orange, but I like the fact that there're more outerwear pieces such as the shearling, peacoat and the raccoon trim bomber. I like Balmain for his cutting, and is now my go-to brand after Hedi's Dior homme. I assume this is the lookbook that explain his seasonal way of dressing, I believe the Karim Sadli/Franck Durand catalog will come later as usual. I can see that shearling jacket being worn with just about everything in my closet. And the bomber jacket, also a fantastic all around piece. Not sure about the styling myself, it's probably because it seems as if it's been done. It's your typical male look now days. balmain is a hipped overpriced all saints. enough said! I think the styling is cool, but it is something that has been seen over the last for seasons. Brands are playing it safe today. I mean this is the look that most men consumers are looking for. Guess they are looking to cater to the next Generation. I also feel that plaid shirts and denim shirts will be around for years to come. They are staple pieces that always seem to sell. They are also being warn from season to season. Brands love items like that. I am over skinny jeans though. I just feel like everything doesnt need to be skinny. Yes I have a few in my closet but i also wear slim fit and baggy jeans, mix it up a little bit. I like the styling here, its young and hip. "NIP & TUC - GONE"